Since the 1950s, the United States Postal Service (USPS) has been using different vehicles to deliver mail to millions of Americans every day. 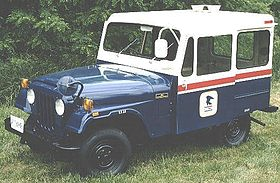 The unusual part is that the USPS has only commissioned two different vehicles in the past 65 years: the Jeep DJ and the Grumman Long Life Vehicle (LLV). The Jeep DJ (or Dispatcher Jeep) featured a sliding door and right-hand drive steering to make delivering mail easier for postal workers, and use of this vehicle began in the 1950’s. These Jeeps were made out of thin sheet metal and stood up to a lot of wear and tear, but eventually the USPS had to replace the DJ with a vehicle that was more fuel efficient and could withstand the grueling task of running long mail routes all day, every day. Once the Jeep DJs were decommissioned in 1984, the USPS decided to set up criteria for the perfect postal vehicle and take it to vehicle manufacturers to see what they could create. There were several manufacturers who vied for their vehicle, but after exhaustive tests, the Grumman LLV was chosen. The LLV’s body was manufactured by Grumman, the chassis by General Motors. The truck body is made from corrosion-resistant aluminum, weighs 3,000 pounds, can carry 1,000 pounds of mail and has a tight turning radius. The Postal Service ordered 99,150 Long Life Vehicles. 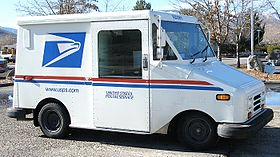 At a cost of $11,651 per vehicle, the USPS contract with Grumman totaled over $1.1 billion ad was the largest vehicle order ever placed by the postal service. The Long Life Vehicles were produced in Grumman’s Montgomery, Pennsylvania plant. During the height of production, the company was producing 100 postal trucks per day. If you’re too young to remember the days of the Jeep, then the Long Life Vehicles may be the only mail trucks you’ve ever known – white, boxy little trucks with the USPS blue eagle on the side. Right-hand drive (RHD) Jeeps are not completely out of the mail delivery picture, though, because they are still often used for rural postal routes. Jeep stopped manufacturing RHD vehicles for a time after the USPS stopped using them in the 80s, but saw the need to continue later on. They began producing RHD Jeep Cherokees and RHD Jeep Wrangler Unlimiteds in 2001 and 2003. The USPS is currently set to roll out their third brand new fleet in 2018. The last LLV was made in 1994, so their 20+ years of service is quickly coming to an end. The vehicle that will replace the LLV is yet to be announced, but the USPS has made it clear that they want to fundamentally change it, only keeping a few of the features from the LLV – like right-hand drive and sliding doors. The new vans will have safety features now standard on passenger cars and light trucks, including a front airbag, tire-pressure monitors, a backup camera, daytime running lights, and ABS. The postal service has also called for more fuel-efficient, less-polluting powertrains and is considering alternative-fuel vehicles for a large part of its fleet. Fifteen different companies responded to their request for design proposals. The replacement fleet will include approximately 212,000 delivery trucks and cost upwards of $6.3 billion to make. To read more about RHD Jeeps, check out our blog: Where, Oh Where Can I Find a Right Hand Drive Jeep?